I love the contrast created by pairing pretty, feminine pieces with edgy ones. That was the sole driving force behind this look that I wore last Friday. In other news, I've decided to take part in Kendi Everday's winter 30 for 30 Challenge! For those unfamiliar, you can get the full scoop here. Lately I've been thinking a lot about my desire to simplify my life. This means taking a hard look at my consumption habits. Ideally, I would like to shift my focus from trendy fast fashion to quality basics. Of course, I still want to have fun with what I wear, but I can easily thrift quirky items. While I don't think this will be a drastic departure from the status quo, I definitely want to make subtle adjustments, so that my behavior more closely aligns with my values. The philosophy of remixing speaks to this goal, and I think the 30 for 30 will be a great starting point in implementing change. Being a procrastinator, I have yet to select my 30 items but will do so tonight. It may be a bit tricky as Kansas weather is unpredictable. As long as some good layering pieces and my snow boots are included, I think I'll be golden. Are you doing the 30 for 30? I'm doing the 30 for 30 challenge! Can't wait to see how everyone does. Also, I love your shoes in this post! Love this look, the jeans and the top are perfect together. I am doing the 30x30. Can't wait to see what you come up with! I'm doing the challenge too! Soo cannot wait to see what you come up with! I'm sure it will be great! I am doing the 30x30 too, and this will be my first time! I'm excited to see what you come up with, I'm always amazed by your outfits. Also, totally jealous of your blouse, I've been wanting a pussybow blouse for months! i am not doing 30 x 30 because i honestly don't think i own much more than 30 wearable, practical winter items! so it would be kinda silly! i like that you are transitioning your shopping habits. i've been working on that, too! Hey I can't wait see you here in Austin in March! I'm doing the 30 for 30 this time around as well! Looking forward to seeing how you remix your items. I'm doing 30 for 30. And excited you are too! Those green earrings = the bomb. Why yes, I am doing the 30x30 challenge, and I'm excited to see what you come up with. Kansas Couture has been one of my favorite daily reads for a while - seeing you do so much with so little will be a treat! =) Good luck. 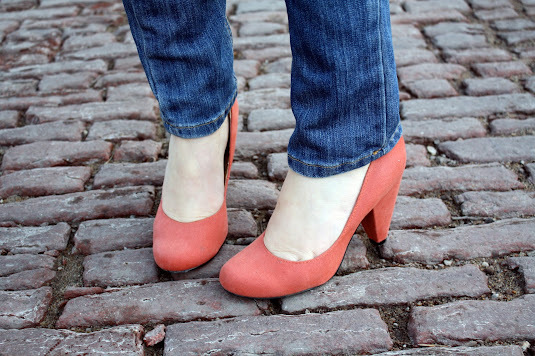 I love the unexpected orange of the shoe with this! Looking forward to seeing you remix the 30 for 30. After spending last year abroad and living out of a suitcase for a year, I'm a little burnt out on this type of exercise :) but I love seeing others tackle the challenge. I too am doing the 30 for 30 challenge. Like you, I'm challenged with the Kansas weather but I'm also challenged by a seven and a half month growing belly! Should make for an interesting month. Looking forward to the challenge. Love how you're wearing the Kendi shoes when you're introducing doing the 30 for 30! I'm participating too and am excited! Those last three paragraphs: ditto. big big ditto. Good luck in the challenge! I am also doing the 30 for 30 challenge! I agree that is is a great way to get inventive with what you already have! It is hard dealing with all of this Kansas snow! I included warm items in m 30 and not as many dresses as I would have liked...but I will be warm! Thank you, thank you for this post. I have a deep love of fashion but have been challenged lately with my own consumption and mis-placed priorities. I know it doesn't take loads of money and foolish decisions to be stylish....and I just appreciate you calling that out here...on your blog. Yay, so pleased you're in the 30 for 30. I love doing it and am joining in again (first outfit today). Looking forward to seeing what you'll be choosing and how you'll be wearing the items. I love the dressiness with a touch a distressed... Perfect balance! I love this mix of very classic, feminine pieces with the slight edge of the ripped jeans - and the red lips and red heels are the perfect bookends. I'm doing the 30x30 too - technically my second time, but hopefully it'll be the first time I finish! This time I'm traveling instead of working, so it should be a bit more manageable - no work to distract me, and I can't really fit much more than 30 items in my suitcase! I'm very late in commenting, but I have to tell you how much I identify with your sentiments about simplifying and centering your life. It's definitely part of the reason that I'm doing the 30x30 this time around, and it's been motivating a lot of what I've been trying to do with myself and my life lately. In any case, I adore this outfit. The earrings are a perfect touch!